Eat Play Love: Merry Shibamas! It has been a crazy few months. I have so many things I wanted to write about, but so less time. If it weren't for Maya, I probably wouldn't even realize it's time for the holiday. Tachi came to stay with us a few days before Christmas and will be around till the end of the year. Thanks to her parents for the lovely bandana, though neither of them was pleased when I put on the "decoration". 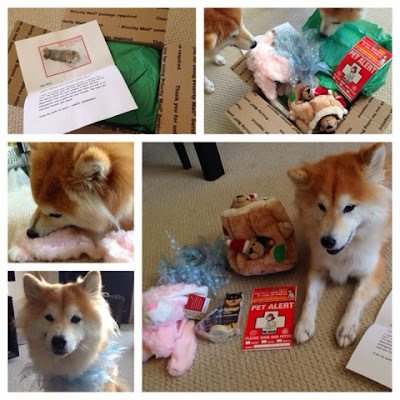 This year, we also participated in Secret Shiba, a gift exchanging event for Twibas (tweeting Shibas). 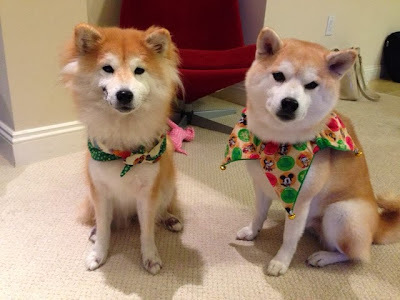 We sent out a gift to a fellow Shiba before Christmas, and get one from another. We are not allowed to open the box till the 25th. 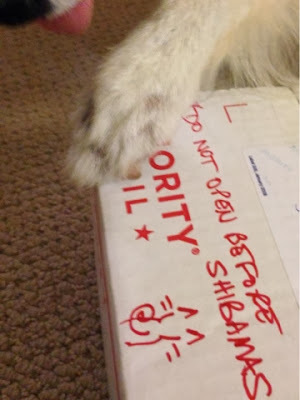 Maya's gift came around 12/16 in a nicely packed USPS box, with the warning "DO NOT OPEN BEFORE SHIBAMAS" written on it. Even though no one's watching, we didn't cheat and waited till Christmas day. Sakura the Diva Dog was Maya's Secret Shiba, and she sent us a few toys, a pet alert sticker, a floral collar, and even a Shiba calendar for the humans! To be honest, these were the only gifts sent and received by our family this year, as we were never that into this tradition. (Immigrants!) However, the anticipation made me felt like a little girl again and I was so glad I signed up. It's interesting to learn how our pets can change us in the ways we would never expected. Happy New year, just want to say Hi. I just get my girl Aeris the shiba, nice blog to go through. Hey, I didn’t find an email address… Can you email possibly me so I can ask you a question about your dog?